The Tucson Entertainment and Events Calendar has local listings of entertainment events happening today, this week or this month for kids, visitors and families. The Tucson entertainment and music calendar has been publishing since 1985. Find something happening every day and evening in Tucson, Arizona at Tucson Entertainment Magazine On Line. Submit free Tucson entertainment, sports and event listings for consideration text only, (no attachments, please). The Tucson Entertainment Magazine has been online since January 17, 1995. Purchase tickets for upcoming Tucson entertainment and sporting events at Ticket Network or TicketFly. Tucson is blessed with great weather in the winter, so there are several special major winter and spring festivals and activities that happen every year. 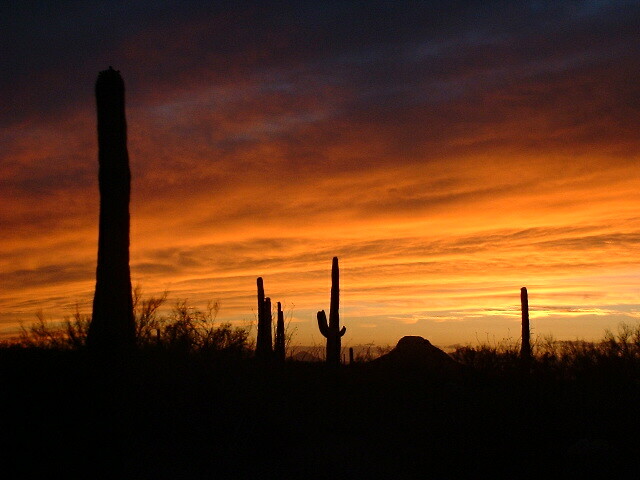 Tucson sunset photo by Chad E. Might. See more Tucson mountain photos. 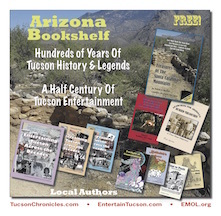 Read sample chapters from books by local Tucson authors, download free PDFs at Tucson Bookshelf. of the current edition of Arizona Bookshelf. Profiles of local Tucson authors and their books. Find out how to download free PDFs of many of these books or to purchase books online. 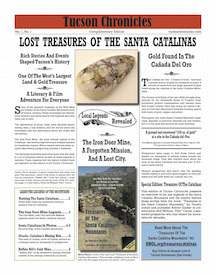 Read about the legends and history of the Santa Catalina Mountains, including the Iron Door Mine legends and the Tucson Gold Rush of the 1880s. 15% OFF ALL HAIR SERVICES! Vasile European Hair Salon has been in Tucson for more than 20 years. Mention This Internet Coupon Special to get 15% off. No need to cut out the ad, just tell Stan or Lydia Vasile you saw the 15% off special online! The entertainment scene in Tucson, Arizona during the 1950s through the 1990s was vibrant. Thousands of local musicians played in hundreds of venues. Now, much of the culture has been preserved for history in a 3-volume set of "Entertaining Tucson Across the Decades." Authentic El Charro Salsa Basico (Mild) salsa from Tucson, Arizona's own El Charro Café. Have a piece of Tucson mailed to you. Find more local products from El Charro Café. Tucson, Arizona is one of the oldest settlements in the United States, ranking in age next after San Augustine, Florida, and Santa Fe, New Mexico. The Santa Catalina mountains has been experiencing a gold rush for hundreds of years. A new book on the "Treasures of the Santa Catalina Mountains" reveals the legends and hidden history of the Catalina Mountains, north of Tucson. Discover how the Spanish, Mexican and American settlers became prospectors and then miners over hundreds of years. Spanish history in Tucson can be traced back to 1649, when a military station was established by the Spaniards to protect the Mission of San Xavier. The area was occupied by Native Americans for over 10,000 years before. Read and download several accounts about Tucson's early pioneer days and Tucson history. Just below Mt. Lemmon's backside lies one of the great stories of the search for gold in the mountains, the lost city and the lost Iron Door mine. Today, a quick drive to the Catalinas reveals that hidden treasures still do exist. Explore the historical records that account for that thousands of pounds of gold in quartz that has been extracted from the Catalina mountains. 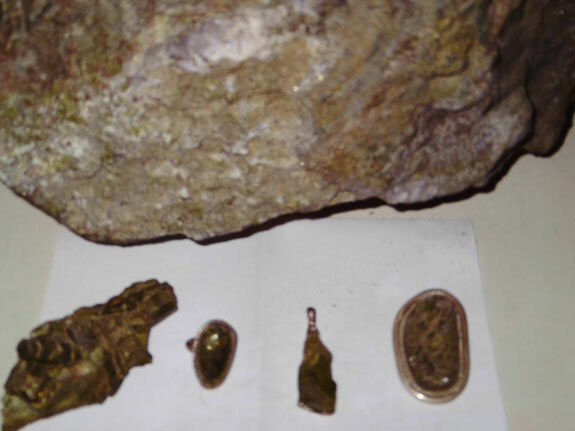 Read about Arizona's Gold Rush. © 1995-2018 EMOL.org.Entertainment Magazine. All rights reserved. Robert E. Zucker, publisher.